For cheap wheels they are well packaged, never had low to mid priced new wheels shipped so well. Removed the plastic they were bagged in, to show the soft fiber liner and nylon snap on lip protector. The only cheap part of the packaging is the box. Either double box or use a heavier box, and it would be considered a premium wheel. These boxes tear easy at the handle holes. Wheel construction seems better than expected. Knowing they are pressure molded and heat treated before finishing, but it seems the paint is powder coated. Or something like it, as it seems to be bonded to the aluminum. Thin but durable. I purposely rolled the edge at the back lip on the cement, and it did not scratch up like the factory Ford Racing wheels I had. 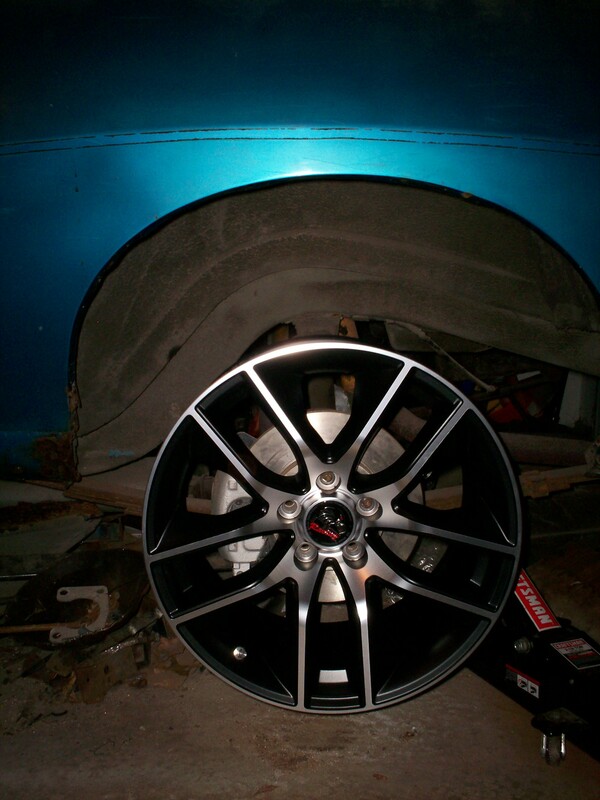 The whole wheel was done in matte black, and the face was machined in the final process. Have 2-1/4" free clearance with wheel rim and spring edge, and outer lip edge just rubs the trim lip, but that was a concern already thought about. Trim lips will be removed or rolled flat. Boy, 12" rotors look a wee small. When you run that much castor your will find that your car will drive like a late model sports car. I did it on a 1969 Camaro and the car was transformed. It tracked down the road like a Mercedes with 0 toe and -1.5• of camber. The Saginaw power steering was fine on the road or on the track. Rambler has the same so you will be okay. I ran this setup for over 10 years and done 50+ track days. I was a track driving coach, and the car was driven to the track. Run a power steering cooler for track use. Just street it won't be necessary. Thanks for the info! 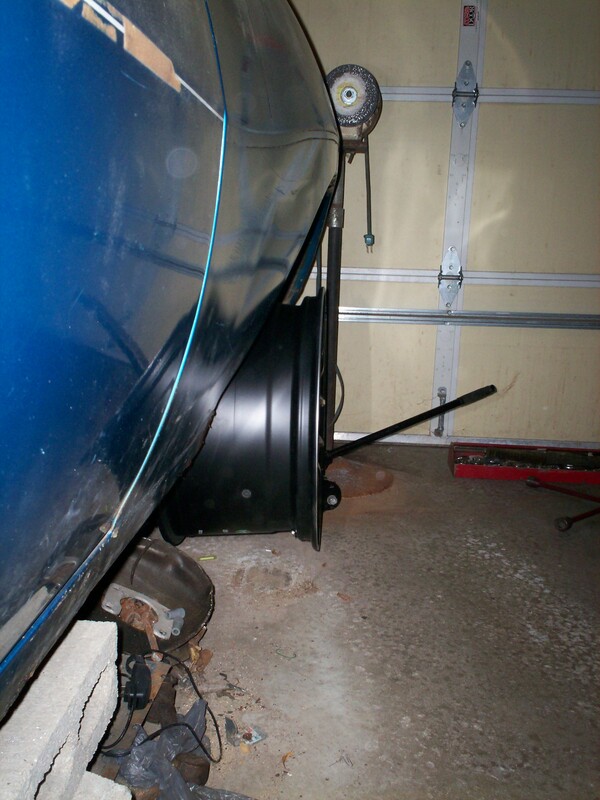 I figured caster will help a lot with newer radial tires, and being bigger width wise will make the steering firmer. Though my rack and pinion setup was planned and done long ago, and things grew as moved along. Never planned on things as they are now, but saw benefit in how much modern sporty cars are using fairly large castor, around 5 to 7 degrees. When I first posted my question, I was concerned about long term street use and steering being touchy. Since a few still use their steering boxes, it seems my steering worries were dashed. I do plan on taking it out to some road coarse tracks, even though I don't plan to do competition. Hopefully Laguna Secca, as I was too young to drive when living around the area. What messed my thinking up, was comparing other older cars with mods. My changes go beyond older cars, and i needed to start looking at new modern cars in design. I hit quite a few sites, looking for wheel and tire combos closer to what I will be doing. Most of which are 2015 on up Mustang Cobras, and Vettes. There are some Camaro SS and SRT / heck Cat guys doing some as well, but they are too heavy for equating like front end dynamics. After looking at 2015 Mustangs, i see a lot of my front end mods being done as a Ford factory change up. Like big truck tie rods, wider length control arms, and wide rims and tires. There is more in common now with my front end with today's cars than i ever planned on. Just so happens i thought of things much earlier than Ford, though we are equally slow in making the changes. HA! Let me know if you run Laguna Seca. It is my home track. 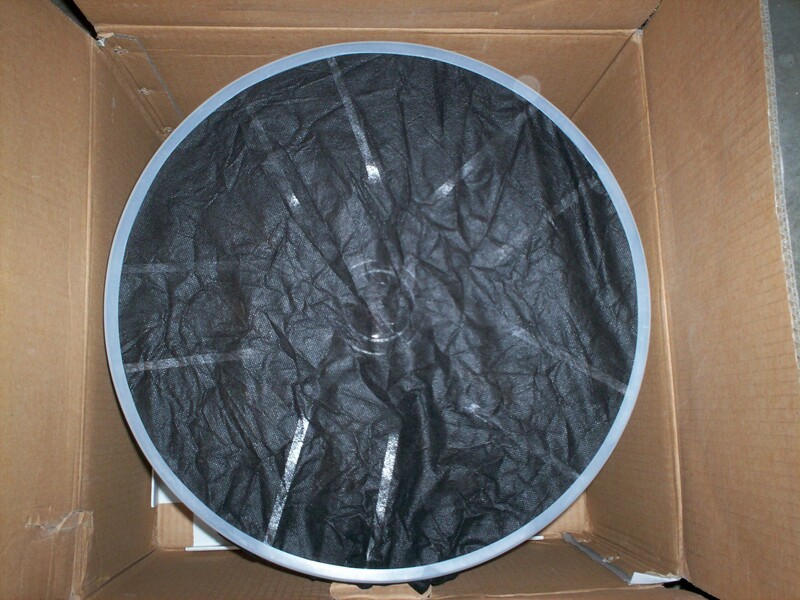 Put on good brake ducting, as it is very hard on the brakes. Get the car quiet unless you run a Shelby Club Unlimited Sound day. Uh, quiet? Well i plan on a dual SuperTrapp setup per side on my full length rocker mounted collectors. So some quietness can be done. After all it is intended on street use. Though with minor adjustments it can be ready for track. About brakes, i am aware of heat on them, and will be using dual small caliper setup per side. Smaller foot print allows more air through the wheel and brakes. May be a wee heavier than large racing brakes. Donno when my car will make it to California, but that track is on my bucket list. Though i have a feeling i will be in a tough battle with time. If it's quiet enough for regular street use you will be fine. 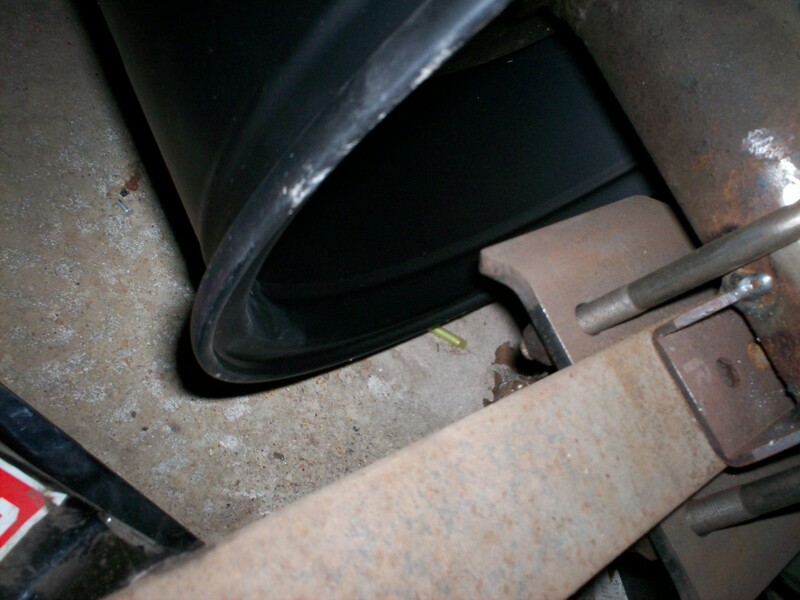 Some drag strips now require mufflers due to encroaching homes. Really should be a "we were here first" thing, but when such laws are applied they are just for the owner at the time of the law, and/or as long as the place is in continuous operation. Close it over a certain time period (not for normal seasonal closing or temporarily for repairs) and it can't be reopened, and in most cases change of ownership will close it permanently. Those laws are really just intended to temporarily stall closing... not just race tracks, sometimes other businesses that have become engulfed in urban sprawl, sometimes homes that have become engulfed in industrial/business development areas. I've seen many small farms suffer from this!